Joey has been an avid cultivator, teacher and cannabis liberation activist for the last 20 years. 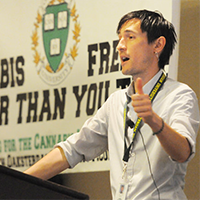 He began his work with medical cannabis in 1994, while attending U.C. Berkeley, when he collaborated with the folks at Cannabis Action Network, who were providing underground care to Bay Area medical patients. Through years of local and statewide political involvement, Joey also worked as a health and wellness educator with the Berkeley Free Clinic, with UCSF’s Center for AIDS Prevention Studies, at LYRiC, (an LGBT youth center in San Francisco), and at the Harm Reduction Coalition in Oakland. Joey began teaching at Oaksterdam University in 2007, and has helped build our expansive horticulture curriculum. He also runs a private consulting company, Let It Grow Consulting, helping local patients/collectives and large-scale commercial growers across the nation to navigate the ever-growing and changing, cannabis cultivation industry.